MIDDLE GRADE GIGGLES & GASPS! | it's yaytime! MIDDLE GRADE GIGGLES & GASPS! 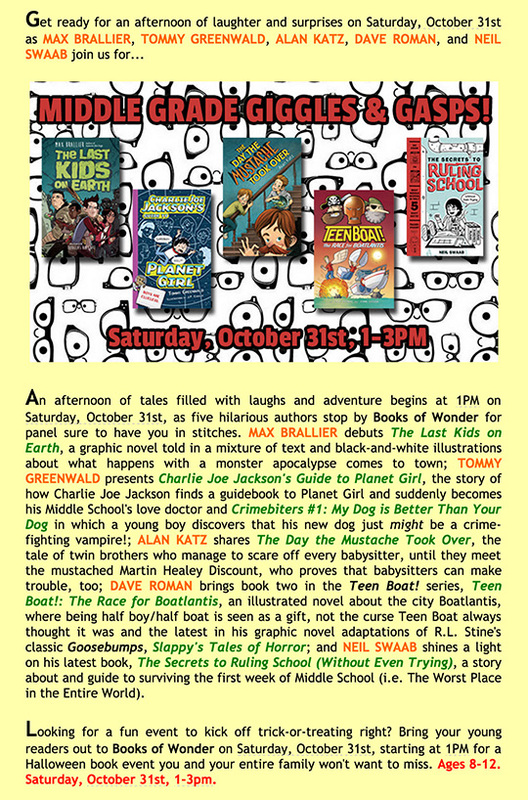 Join Books of Wonder for an afternoon of giggles and gasps as MAX BRALLIER, GITTY DANESHVARI, TOMMY GREENWALD, ALAN KATZ, DAVE ROMAN, and NEIL SWAAB stop by for an afternoon of Middle Grade books you and your young reader won’t want to miss! More info at the Books of Wonder website. The store is located at 18 West 18th street (between 5th and 6th Avenues). This entry was posted in Blog Entries and tagged book events, Books of Wonder, Goosebumps, NYC, Slappy, teen boat. Bookmark the permalink. One Response to MIDDLE GRADE GIGGLES & GASPS!